Fourteen-year-old Kentucky girl Ricki Jo Winstead, who would prefer to be called Ericka, thank you very much, is eager to shed her farmer's daughter roots and become part of the popular crowd at her small-town high school. She trades her Bible for Seventeen magazine, buys new "sophisticated" clothes, and somehow manages to secure a tenuous spot at the cool kids' table. She's on top of the world, even though her best friend and the boy next door, Luke, says he misses "plain old Ricki Jo." Caught between being a country girl and a wannabe country club girl, Ricki Jo begins to forget who she truly is: someone who doesn't care what people think and who wouldn't let a good-looking guy walk all over her. It takes a serious incident on Luke's farm for Ricki Jo to realize that being a true friend is more important than being popular. 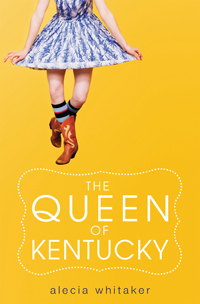 The Queen of Kentucky was optioned for a motion picture by Unbridled Films and is being produced by Permut Productions. Read about the deal in Variety. "Reading Alecia Whitaker's funny and sweet debut was like spending time with my best friend. Ricki Jo Winstead totally won me over, and she'll win you over, too." "Whitaker's debut sparkles as she takes the reader on a tour of two unforgettable places: small town Kentucky and the heart of our charming and hilarious narrator, Ricki Jo."